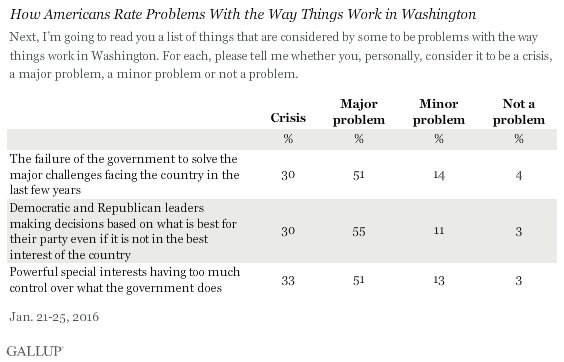 WASHINGTON, D.C. -- Three in 10 Americans say that the failure of the government to solve major challenges facing the country is a "crisis." Similar percentages see two other issues -- party leaders making decisions based on what is in the best interest of their party, and special interests having too much control over the government -- as crises. Additionally, a majority of Americans consider each item to be a major problem. In total, over eight in 10 see each issue as either a crisis or a major problem. These results come from a Jan. 21-25 Gallup poll. Americans have expressed an ever-rising level of dissatisfaction with the federal government in recent years, including in 2014 and 2015, when pluralities of U.S. adults mentioned some aspect of government as the nation's top problem. Diagnosing the precise problems of the federal government, however, is no easy task. Gallup has tested three prominent theories as to why the government may work in ways that earn the country's disapproval, and has found that Americans rate the seriousness of all three similarly. Americans' belief that these factors are corroding the nation's political system is nothing new. Similar percentages judged each of these issues to be as serious in 2008 as they do today. These major concerns about the workings of Washington are undoubtedly fueling the rise of unconventional presidential candidates in the 2016 election, such as Donald Trump and Bernie Sanders -- both of whom scored big wins in the New Hampshire primary Tuesday night. Republicans are twice as likely as Democrats to say that the government's failure to solve the country's major challenges represents a crisis, at 41% and 20%, respectively. Independents fall in between, with 32% saying this issue is a crisis. The three political identities are in greater accord on the other two theories tested. 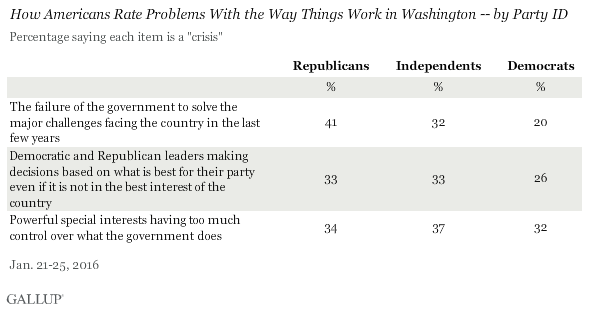 Both 33% of Republicans and 33% of independents believe political leaders who put their party first constitutes a crisis, and about as many Democrats (26%) agree. On the third theory, the identities are almost perfectly aligned, with 34% of Republicans, 37% of independents and 32% of Democrats saying the level of governmental influence that special interests possess is a crisis. Americans' frustration with the federal government has been a rising force in politics, and may play a decisive role in how many Americans vote in this primary campaign and in the general election. These findings confirm that the vast majority of Americans consider the inability to fix problems, partisanship and the influence of special interests to be major problems or crises for the nation. Such perceptions could produce unexpected outcomes in the various phases of the 2016 presidential election, such as a political outsider or "anti-establishment" candidate winning the presidency. In 2008, Barack Obama, a freshman senator, perhaps benefited from Americans' desire to elect a politician less steeped in the Washington political culture -- and that desire seems to be burning just as bright in this election, if not brighter. But the lack of improvement in public opinion on these three dimensions since 2008 suggests the next president, like Obama, may struggle to change these pessimistic views. Results for this Gallup poll are based on telephone interviews conducted Jan. 21-25, 2016, with a random sample of 1,022 adults, aged 18 and older, living in all 50 U.S. states and the District of Columbia. For results based on the total sample of national adults, the margin of sampling error is ±4 percentage points at the 95% confidence level. All reported margins of sampling error include computed design effects for weighting. Strong majorities of Americans say being a state governor (72%), a member of the U.S. Senate or House of Representatives (65%), or U.S. secretary of state (63%) is excellent or good preparation to be an effective president. Americans are about twice as likely to prefer that their party nominate a candidate who agrees with them on almost all issues they care about, rather than one who has the best chance of winning but does not agree with them on issues.